A lynx (/ˈlɪŋks/; plural lynx or lynxes) is ony o the fower species within the Lynx genus o medium-sized wildcats. 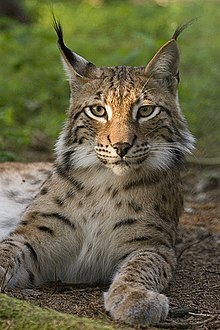 The name "lynx" originatit in Middle Inglis via Latin frae the Greek wird "λύγξ", derived frae the Indo-European ruit "*leuk-", meanin "licht, brichtness", in reference tae the luminescence o its reflective eyes. Thare is considerable confusion aboot the baist way tae classify felids at present, an some authorities classify them as pairt o the genus Felis. Neither the caracal, sometimes cried the Persie lynx or African lynx, nor the jungle cat, cried the swamp lynx, is a member o the Lynx genus. ↑ Wozencraft, W. C. (2005). "Order Carnivora". In Wilson, D. E.; Reeder, D. M. Mammal Species of the World (3rd ed.). Johns Hopkins University Press. pp. 541–542. ISBN 978-0-8018-8221-0. OCLC 62265494. ↑ 2.0 2.1 "Definition of lynx from Oxford Dictionary". Oxford Dictionary. Retrieved October 5, 2010. ↑ "lynx — Definition from Longman English Dictionary Online". Longman Dictionary. Retrieved October 5, 2010. ↑ 4.0 4.1 "Lynx". Retrieved October 5, 2010. This page wis last eeditit on 8 Mey 2017, at 23:49.